For the past few years content has been increasingly important to the marketing mix. Content in the form of articles, e-books, case studies, infographics and videos connect you with your buyers when and where they are looking to buy. Long form content and key phrases are instrumental to being found in an online search, a top ‘go to’ resource for finding your products. The challenge is working with meaningful, well-produced content that is used in the right place at the right time. 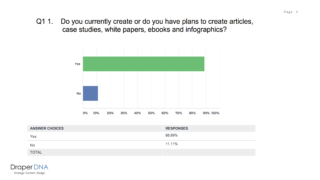 We recently surveyed a diverse group of building products manufacturers about their strategies and plans for content marketing. We learned that 89% of the manufacturers use some form of content in their marketing mix and 100% stated they would publish more content if it were easier and less expensive to produce. Manufacturers are aware of the value of content marketing. The time commitment and demand for meaningful, well-produced content is proving to be an obstacle for them. In turn, it is an opportunity for others to help them succeed. There are two different paths currently being taken by manufacturers with two different destinations. It is important to recognize both paths and use them for the best outcome. Creating your own articles, e-books, case studies, infographics and videos is the most effective way to meet and exceed your content marketing objectives. Featuring your products and services when speaking specifically to your customers and prospects assures your team the ability to deliver the right information in the right place at the right time and under your brand. You control all facets and you reap the benefits. There is no doubt that the information is about, or where it came from. There are a few manufacturers doing a terrific job publishing professionally produced content under an editorial calendar. 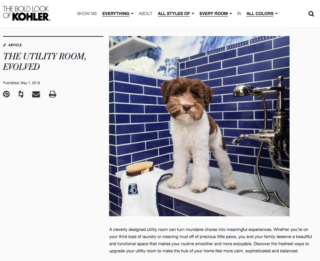 Kohler is a great example of a manufacturer that integrates their original content across platforms – print, digital, social, in person – under a well-planned editorial calendar. As a result, they are able to optimize their investments as a part of their brand and lead generation programs. Now we know not everyone has the dedicated internal resources these few self-publishing manufacturers possess, so you may have to look for alternative solutions. Here is where the second path surfaces – content programs being offered by trade and consumer publishing companies. Most of the time, manufacturers purchase a sponsorship of a dedicated email or newsletter in which the content features a reference to the brand. Of course, the prominent brand is the magazine title. There are a few programs available where the magazine will co-brand an article, case study, video or e-book to feature in their publications. The real value of these programs is the access to the readers of these magazines. The downside of these programs is the competing brands. 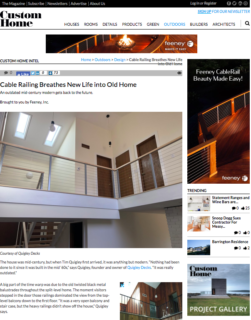 As a one-time magazine founder and publisher (Woodcraft Magazine) and building products marketer, here are two suggestions or secrets to success for your content marketing efforts. Let’s begin by addressing the time and professional quality challenges of the manufacturers. We, Draper DNA, are launching a network of top professional writers and designers with industry subject matter expertise for both trade and consumer content. Built from our 30+ years of marketing home and building products, the network will officially launch September 7th. If you are interested in learning more about the network, send us a quick email and we will share the program details. Next, if you plan to continue to participate in the trade publications co-branded programs to reach their readers, make certain you add a call to action to acquire the name and information of the readers that are interested in you and your products. Once the readers opt in to your program you can forego the shared content and provide them with focused information from and about your brand. The same is true for the attendees of the events you sponsor with the magazines. Add them to your prospect database. The cost of both of these options is typically the same in both hours and dollars. The differences are your objectives for the investment and who is in control. Do you wish to focus on your brand or theirs? Receive a copy of the Content Marketing Survey for free with the Coupon Code CONTENT at DraperDNA.info.